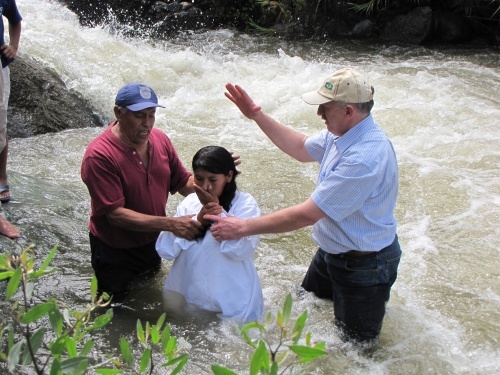 Baptism in Jimbe, in the Andes of Peru, in a rushing river. 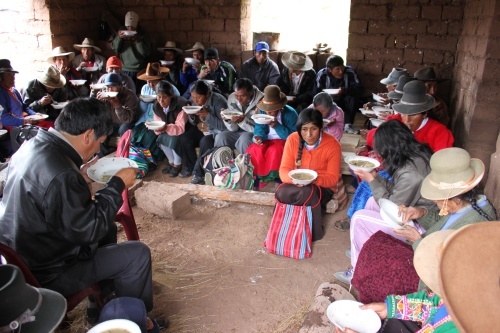 Community and lunch after the church service in Yanaoca. As I am writing this report I would like to give you some insight into my official trip to Peru. I am very grateful for making this journey together with Arturo Köbernick, our Regional Representative for the Spanish-speaking countries. Assisting and complementing each other is very important to both of us. Time and again we are moved by the way the Lord blesses our team work. It was a very intense time, filled with travels and activities. Again, we were privileged to witness our Lord Jesus at work firsthand, which fills us with joy and thankfulness to God. It is simply marvellous to see how Christ reaches people with his gospel. We could baptize people in a running river, experience the passionate commitment of missionaries, we could leave a meeting where problems were discussed and learn that the Holy Spirit brought about the willingness to repent and to change. This time, we visited three regions in Peru: Jimbe, Yanaoca and Curahuasi. There were several meetings with the leaders; these were marked by mutual trust, transparency in communication and responsible accountability, and all of them led to very positive results. This fills us with joy and confidence regarding further fruitful cooperation in future. In Jimbe, the brothers and sisters of the five mission stations in this region met for a weekend „Mission Congress“. Some 150 people gathered, with the leaders of the Trujillo regional association attending as well. All those participating showed great joy and enthusiasm. Our missionary, Hugo Mondoñedo, and his wife Carlota organized this Congress with great love and commitment. Good sermons, joyful worship, missionary challenges and great times of fellowship appealed to the people and touched them. On Sunday morning, four people were baptized in a running river, in a deep valley at about 2 km from the town. We are rejoicing and are very grateful for what God makes happen in Jimbe and its surroundings. On a Wednesday morning and afternoon, we had a meeting in Yanaoca. The leaders of the mission projects from eleven villages gathered. Some had walked up to 8 hours to get there. We are moved to see with how much joy and passion these missionaries are on the roads in order to reach the people in this whole region (the Quechua) with the gospel. Modesto Puñal, who has been the MASA missionary in this region for two years, does a very good job, which is coordinated by Adrián Campero. In Curahuasi, we had several talks with Tomás and Concepción Chaparro, the missionary couple, and with the leaders of the mission projects in the Apurímac/Cusco region. Here, we had to and could address a few important issues relating to the mission work in Curahuasi, and we could clarify them. We are thankful that our co-workers are open for changes when these are relevant for the mission work. A big challenge will be building the small church and the Samaritans’ House in Curahuasi. We hope that the Lord will provide the ways to implement this project in the years ahead. We had a lot of time for sharing and planning the future with Adrián Campero. We are very happy about the way the Lord continues to use this man.